Mt. 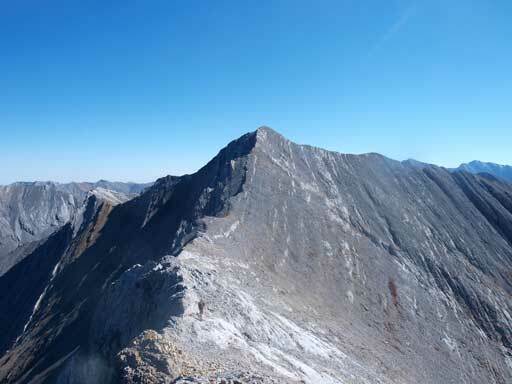 McDougall is the only officially named peak among the 6 in “The Big Traverse”. It’s a well documented trip covered in Andrew Nugara’s More Scrambles book. 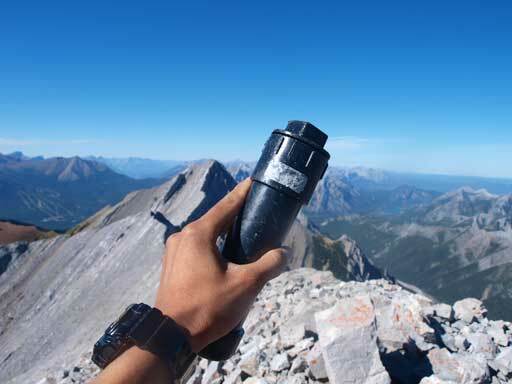 Though not as impressive nor high as the nearby Old Baldy Mountain, its summit offers equal quality views. There’re numerous routes up this mountain. 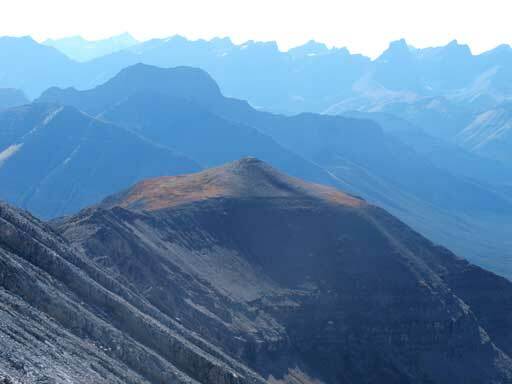 The traverse from Old Baldy is a moderate scramble while the traverse from “Volcano Peak” is a difficult scramble. 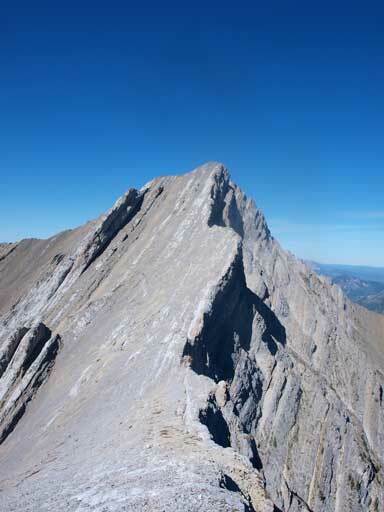 The traverse from “Volcano Peak” looks easy but involves a couple tricky downclimbs. Folks have attempted that route in winter but most of them had to turn around. 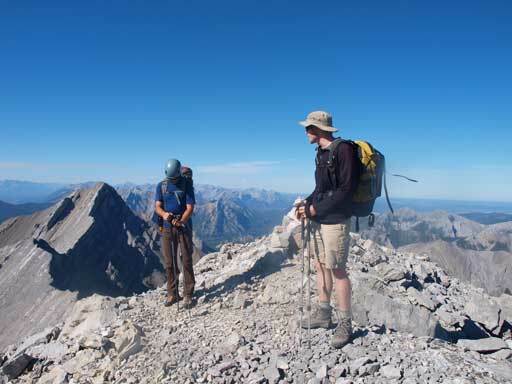 After taking a lengthy break at the summit of Old Baldy Mountain, Neil, Tyler and I decided to continue the traverse to complete the mission. Getting to Mt. McDougall was not easy scrambling neither. 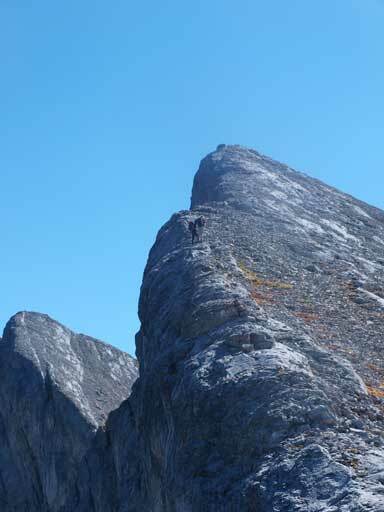 We tried to follow the ridge down, but immediately we were blocked by a nasty and exposed down-climb. I tried to give it a go but the holds were very loose. We backtracked for 20 m and traversed to the scree/rubble on skier’s right, and slogged down to the col. Then we had to regain all of the elevation loss because Mt. 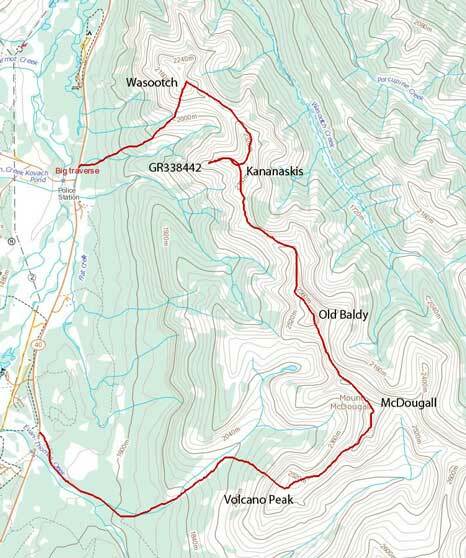 McDougall is only marginally lower than Old Baldy. Looking N. over Old Baldy. Nakiska Resort on left. 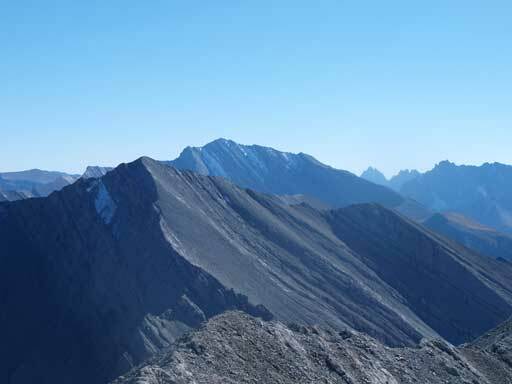 Mount Baldy and Midnight Peak on left. Tiara Peak on right. Moose Mountain in the far distance at center. Mount Bryant just to the right. Tyler and Neil on the 5th summit of our day! Volcano Peak, our last objective. We took another lengthy break on the 5th summit of this day and discussed a lot about our summer adventures. Eventually we decided to descend. Don’t forget to grab Volcano Peak at the end of the day. How long did it take to do all of them? From Wasootch to Volcano, Round Trip was about 12 hours. We got great condition so moved fairly quickly.